Crop producers could see corn prices rise in 2016, according to Purdue's Chris Hurt. 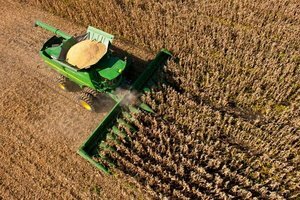 An analysis from Purdue University agricultural economist Chris Hurt released on Dec. 21 indicated that corn prices could potentially increase in 2016. However, the outlook for soybean and grain growth remains less certain. "Corn prices are expected to increase in the winter and next spring by at least enough to cover on-farm storage costs," Hurt wrote in his analysis. "Eastern Corn Belt basis levels are expected to remain very strong, especially in Indiana where low yields were dominant in the northern two-thirds of the state." Additionally, Hurt projected that cash prices for corn could potentially reach the low $4.00 range per bushel in the coming months. By summer, these totals may hit $4.40 per bushel. However, greater soybean acreage could depress prices heading into 2016. For this reason, prices are expected to stay below total production costs. Grain prices may see a similar future as a result of a strong U.S. dollar. "There are two ways the strong dollar is weakening U.S. grain prices," Hurt continued. "First, a strong dollar means that the currencies of our foreign buyers are weak and have reduced buying power for U.S. farm products. Secondly, the currencies of our export competitors are weak, and this makes their corn, soybeans and wheat more price competitive." Full details from Hurt’s analysis on grain, soy and corn predictions can be found in his report, which is available for download on the Purdue website.